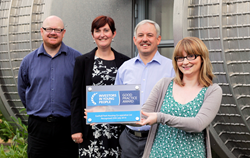 Easthall Park Housing is the first co-operative in Scotland to receive the Investors in Young People Award. Easthall Park Housing Co-operative recognises the energy and enthusiasm that young people can bring to serving their community as well as the creativity and imagination that any business needs to innovate and respond to future demands. Easthall Park has become the first housing association in Scotland to achieve a new accreditation recognising its work with young people. They were awarded with Investors in Young People (IIYP) accreditation following an assessment by an IIP Specialist. The accreditation is the result of a new initiative from Investors in People Scotland which has been supported by £1 million funding from the Scottish Government. Chief executive of Investors in People Scotland, Peter Russian commended Easthall Park Housing Co-operative for its commitment to young people and its strong focus on creating employment and training opportunities. Easthall Park provides an annual SVQ in health and social care in partnership with Glasgow Kelvin College. They also deliver environmental training programmes, provide an annual student bursary award, work with partner organisations to create significant modern apprentice and placement opportunities, as well as employ a substantial number of young people. Easthall Park Housing Co-operative chairperson, Joe Gracey, said: “We are delighted to be one of the first businesses in Scotland to achieve this award and are glad to be able to demonstrate the benefits young people add to the modern workforce. Claire McGraw, Senior Housing Officer, who received the award on behalf of the business, commented: “It’s extremely important that you work for an employer that sees your potential and works with you to realise this. Easthall Park has been that employer for me. When l started l was twenty and very keen, ambitious and had loads to learn. Being quiet this perhaps didn’t always come across. Despite this Easthall Park picked up on my strengths and ambition and involved me in new and interesting tasks. They set me challenges and supported me through the whole process by encouragement, guidance and putting me through college and university. Peter Russian, Chief Executive of Investors in People Scotland commented: “We offer our heartfelt congratulations to the team at Easthall Park Housing Co-operative for being the third company in Scotland to achieve IIYP accreditation." Angela Constance, Cabinet Secretary for Training, Youth and Women’s Employment said: “Nurturing the talents of all of our young people is key to Scotland’s continued economic success and the viability of our businesses. We share the ambitions of young women and men who want to build on their skills to forge successful, sustainable careers and we applaud far-sighted organisations who invest in their own future. “The Investors in Young People Award was a key recommendation from the Commission on Developing Scotland’s Young Workforce and is available only in Scotland. It recognises firms that have taken a particular interest in supporting young people and is another demonstration of how the Scottish Government is committed to working with employers, colleges, trainers and young people themselves to grow their own talent.